For centuries women have kept tokens of love trapped in little heart-shaped lockets around their neck. Words of love, pictures or even a trinket from their beloved, such as a lock of hair, was kept close to the breast as a constant reminder of their one and only. But this is 2015. And as much as we still love hanging onto little notes or a picture of our latest Tinder match, rocking an antiquated locket isn’t really an option for most fashion-savvy ladies. 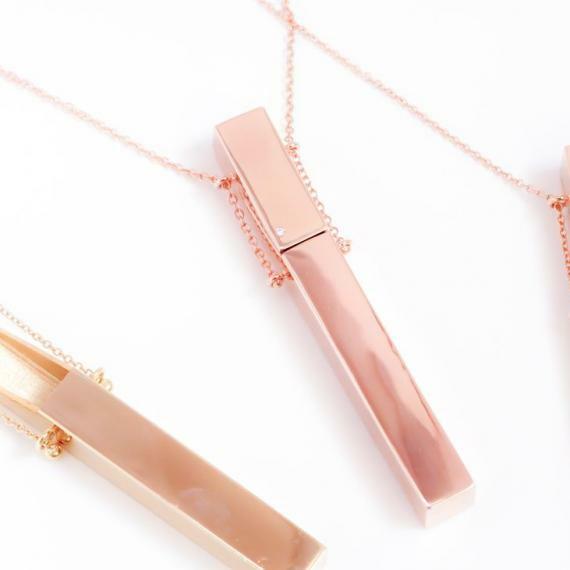 Which is why we love Mas Bisjoux’s Volte Pendant Necklace. It offers a modern twist on old-fashioned sentiment. The rectangular piece seems like an on-trend bar at first glance, but actually opens to reveal a small space for letters, pictures or vials of blood if you’re into that. Coming in a range of metals from silver to solid gold, the bar is accented with diamonds and can be engraved with a personalized sentiment for the one you love. You have to admit, this beats a box of chocolate and roses any day.